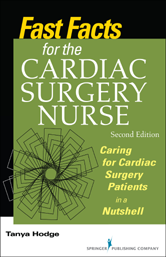 This handy clinical guide provides speedy access to information and guidelines cardiac surgery nurses need to know and use daily. It covers all aspects of care from preoperative to recovery, with an emphasis on prevention and management of postoperative complications--an area where nurses can really make a difference and improve care. The second edition is completely revised and updated, with such highlights as new coverage of risk factors for stroke, thoracic aortic aneurysms, and congenital heart disease, and updates on new surgical techniques and devices.